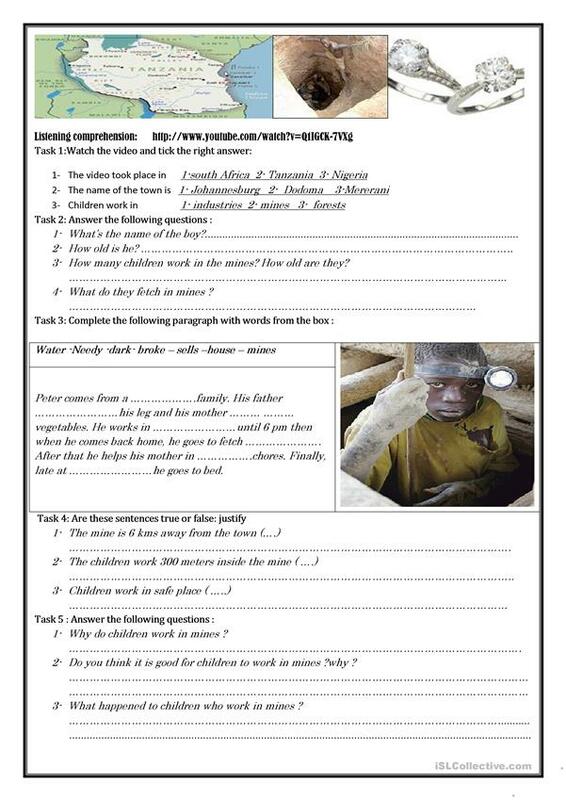 A LISTENING COMPREHENSION ABOUT CHILD LABOUR in Tanzania mines / THE LINK OF THE VIDEO IS PROVIDED IN THE WORKSHEET. It includes : 1- ticking the right answer 2- true or falses statements 3- answering wh questions 4- completing sentences with missing words 5-giving ones personal opinion about child labour.I hope this worksheet is useful for your pupils. The above downloadable worksheet is recommended for high school students at Pre-intermediate (A2) and Intermediate (B1) level. It is a valuable material for working on your learners' Listening skills.